Do you remember this cushion I made a couple of weeks ago? Here's the original post about it. 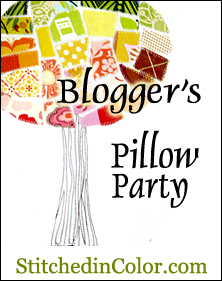 Well I've decided to enter it in this months Bloggers Pillow Party. Wish me luck! Good luck! You gave me the idea to (someday) stitch one of my daughter's drawings so thanks for that! Good luck..It looks great! I have one in this month too! Really great idea! I read your other post too. So sweet to tuck the pjs in there!